When you move to a home in the suburbs and away from the city, you would usually experience a few advantages, in terms of environment. First, there won’t be the usual weekday traffic that can be very time-consuming and tiring to a driver. Then, you can enjoy driving along highways and hilly winding roads. When you move your family to the suburbs, though, you might find yourself outgrowing your usual subcompact, B-segment sedan. Not only do you need to haul stuff in case of emergencies (such as extra clothes in the trunk). You would also want to have a more confident driver, especially when passing big trucks and smoke-belching jeepneys and avoiding jaywalkers running across four-lane highways. 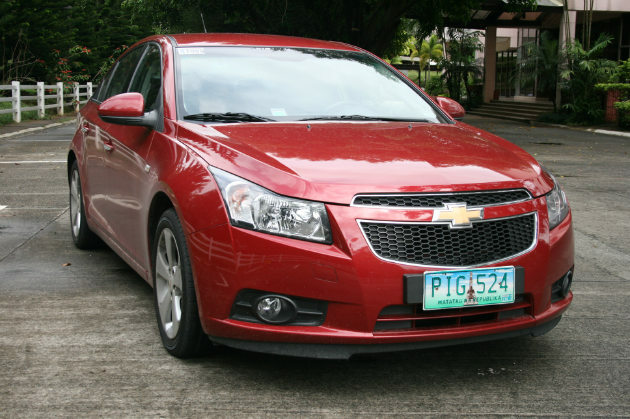 The Chevy Cruze LT was lent to us for review at just the right time. We came right from reviewing a bigger family car (an SUV, actually) and we kind of missed the space and luxury. Though not exactly in the leagues of luxury marques and competitively-priced full-size sedans like the Nissan Teana and Honda Accord, which we were likewise able to review these past weeks, the Chevy Cruze holds its own, especially compared with other models in its class, such as the Hyundai Elantra and Honda Civic.